SHADOW (Book 2 in “The Romany Outcasts Series”) – 2 June, 2016. MIDNIGHT (Book 3 in “The Romany Outcasts Series”) – 2017. When I came up with the idea of using a secretive Gypsy society as the foundation of my YA urban fantasy novel Grey, I was actually doing a bit of my own family tree research. My great aunt had published a book for my father’s side of the family years ago, detailing the family history from the 1800’s to the present. My ancestors on my father’s side had often been referred to as “Black Dutch”. This term was in use many generations ago in the Deep South of the United States – and there are many possible meanings, though no definitive definition. I did, however, come across several articles that listed those with a Romani heritage in the list, and that sparked both my interest and my curiosity. This led to more research on my end, and the creation of my own fictional version of a Gypsy population living in the southern U.S. In creating my Gypsy world, I wanted to be respectful of the diverse culture of the Romani people, but without feeling tied down to any particular one. I wanted a fictional society that felt realistic, yet had its own rules and order. That being said, I’ve listed five facts I’ve gleaned from my research on Gypsy culture that I’ve found to be fascinating and that I’ve attempted to convey in my YA series “The Romany Outcasts”, beginning with Grey. 1. Gypsies keep a distinct and separate culture from the non-Roma. Often you’ll find many stereotypes surrounding the Romani society because they have historically kept to themselves. It is a way of maintaining their heritage and traditions. Recently, some of that has been explored in popular reality television shows, such as “My Big Fat Gypsy Wedding”. In my novel, I enjoyed exploring two groups of modern Romani who exist quietly among the gadje (non-Roma). 2. Many Roma marry young, and there are still traditional roles and expectations for both men and women. Traditionally, Romani children marry early – between 16-18 years old. A teenager is considered an adult once they have married. Often, boys and girls are pulled out of school early to learn trades and to begin managing the household. The Outcast Gypsies in Grey maintain some traditional beliefs on the roles of men and women, including marriage, but there are also characters in the story – Josephine, in particular – that challenge those roles. 3. Gypsies have their own laws, and they are treated seriously. In addition to the laws of whatever place they live, Romani also maintain their own laws and customs. Gypsies who break these laws can be cast out of Roma society. The Outcasts Gypsies in my story place great importance on their laws, and there are grave consequences that happen to some of my characters when choices are made to go against the clan. 4. Gypsies place value on extended family. The Romani traditionally travel in groups of large, extended families. Even those that choose to have sedentary lives still value these large families. The Gypsies in Grey are part of a much larger group of families that make up their clans. Family ties are a central part of the conflict in the story. 5. Gypsy culture is diverse. There is no one single Roma culture. Even the Romany language itself has several variations. The Outcasts Gypsies in my book series come up against other clans and families that do not hold the same views. Writing a fictional society of Gypsies was an amazing experience that allowed me to create a whole other world with some very unusual characters and beliefs. Gypsies have been used frequently in fantasy books as fortunetellers or wielders of magic. I didn’t want to go that route with my fictional Gypsy culture. Besides being a bit stereotypical, it’s simply overused. I wanted my characters to have a rich history that felt real, but which happened to include an unusual supernatural element. I won’t say anymore about the supernatural element in Grey so as not to include spoilers, but these Gypsies have a past that is wrapped up in the supernatural as a means of survival. It is what has allowed them to survive for so long, and it’s a past that these characters can’t escape. Christi J. Whitney is a former high school theatre director with a love for the dramatic. She lives just outside Atlanta with her husband and two sons. When not spending time with them or taking a ridiculous number of trips to Disney World, she can be found directing plays, making costumes for sci-fi/fantasy conventions, geeking out over Doctor Who, and watching superhero movies. 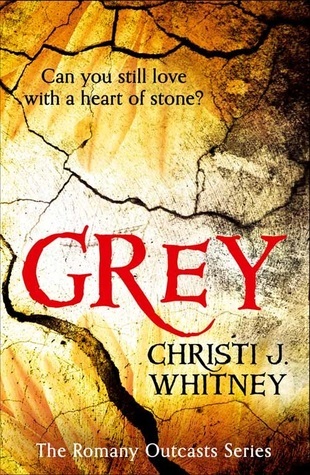 Thanks so much for joining the GREY blog tour, Cremona!! !